What were the first trilobites in the fossil record, and what do they tell us? SIBERIA The International Commission on Stratigraphy has proposed that the start of Series 2 of the early Cambrian is marked by the first appearance of trilobites in the fossil record. Depending on the dating system, this would be about 521 million years ago, on what are currently the continents of Africa (Morocco), Europe (Russia, Spain), and North America (Laurentia). Hollingsworth (2008) listed the contenders for the earliest trilobites, including Profallotaspis jakutensis from Siberia; Fritzaspis sp. from the Esmeralda Basin of western Nevada and eastern California; and Hupetina antiqua from Morocco. Recent work in Spain (Linan et al 2008, and 2015) adds Serrania gordaensis (another bigotinid) and Lunagraulos tamamensis to this potential set of first trilobites. By comparison, the oldest trilobites from China and Australia (Abadiella) are significantly younger. Similarly, the Olenellus Biozone of Laurentia lies many meters above the Fritzaspis Zone. Two of the four first trilobites belong to the superfamily Fallotaspidoidea (order Redlichiida, suborder Olenellina), but although there are several early fallotaspids in Morocco, the earliest trilobite there, Hupetina, is in the family Bigotinidae (currently assigned to the order Ptychopariida, superfamily Ellipsocephaloidea). Similarly, the first trilobite in Spain is another bigotinid, Serrania. 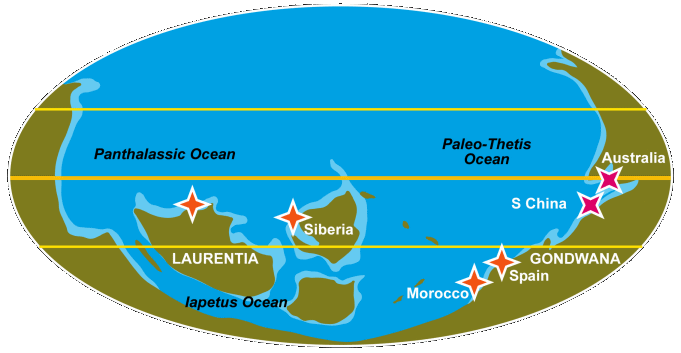 When the locations of these first trilobites are plotted on the map of the Early Cambrian world, we can see that those of Laurentia and Siberia were in paleotropical latitudes, while Morocco and Spain were temperate. The similarities and differences between locations (such as the early prominence of fallotaspidoids in Laurentia and Siberia, bigotinids in Morocco and Spain, and redlichiods in China and Australia) might be explained by their paired settings in relative isolation from each other at the time. Each was a center of trilobite evolution creating endemic sets of distinctive species, genera, and even families. The Olenellidae, for example, are best developed in Laurentia, while China and Australia have been referred to as the Redlichiid Realm. Early Cambrian paleocontinental positions and the first trilobite localities. In Siberia, the first trilobites mark the base of the Atdabanian Stage. Profallotaspis is succeeded by two species of Repinaella, as well as Bigotina. As noted above, this set is most similar to the western Laurentian assemblage. The next zone is characterized by Delgadella (previously Pagetiellus) with Archaeaspis hupei at the base. These early trilobites appear long after archaeocyaths and brachiopods in the same area (Repina, 1981). In Laurentia, the first trilobites appear below what was once considered the base of the Montezuman Stage, marked by the "Fallotaspis Zone." This Fritzaspis Zone is named for the first appearance of the trilobite Fritzaspis, a form lacking genal spines, which is rapidly followed by Profallotaspis?, Amplifallotaspis and Repinaella? which together comprise the Fritzaspis assemblage. In Morocco, the first trilobites appear simultaneously with archaeocyaths, with Hupetina appearing first, Eofallotaspis appearing just afterward (Geyer, 1996; Sdzuy 1978). In Spain, bigotinids appear at a similarly early position (Pillola, 1993; Liñan et al., 2005). The first trilobites in south China and in Australia, both species of Abadiella (redlichiids), appear to be younger than the early trilobites of Siberia, Morocco, and western Laurentia (Paterson and Brock, 2007). Additional radiometric dates -- there being none from the Cambrian of western Laurentia -- and geochemical studies should resolve these correlations. For the remaining global regions, the first trilobites include Schmidtiellus in Baltica, and Callavia in western Avalonia. But both are distinctly younger than the old trilobites of Siberia, Morocco, Spain, and Laurentia. Very shortly after the appearance of the first trilobites, there are several other genera that appear in each of the regions. Here is a listing of some of these early genera, in rough order of appearance, oldest at bottom. The three tiers of this table roughly correspond to the Lower, Middle, and Upper Atdabanian of Siberia. The boldfaced genera are the nominate genera for descibed biostratigraphic zones (e.g., the Fritzaspis Zone of Laurentia, the Eofallotaspis Zone of Morocco, etc.). Names in quotation marks are specimens referred to the genus, but not matching the type for the genus well, they probably represent new or different genera; Names followed by question marks are likewise uncertain in their generic attribution, but there are stronger similarities. Names in bold are the genera that characterize trilobite assemblages in biozones (e.g., the Fallotaspis Zone of Laurentia). Thanks to James Cook and Stew Hollingsworth for assistance with this table. All have parallel-sided or tapering glabellae with simple, even lobation, and well-developed, wide-set eye ridges that converge on and typically merge into the anterior lobe of the glabella. There is often a wide preglabellar area (indicating a natant hypostome). There may or may not be genal spines present, but when present, they can be well-developed. Another notable tendency is for there to be a rearward pointing angle in the posterolateral margins of the cephalon, sometimes bearing a metagenal spine. Some have suggested that the ridges and furrows running from the ends of the ocular ridges to the metagenal angle or spine in fallotaspidoid trilobites are homologous with the posterior facial sutures of suture-bearing trilobites. From the very start of the trilobite record, facial sutures are present in bigotinids and other ellipsocephaloideans. In Spain and Morocco (Western Gondwanaland) Lemdadella is another early trilobite bearing sutures. Jell (2003) noted that sutures seem to appear independently in another major early lineage: the redlichiids of Australia and China, but it is not at all clear from what ancestor they arose. It is quite interesting that the first trilobite found in Morocco, below even the fallotaspidoids, is a suture-bearing bigotinid, Hupetina antiqua. This potentially complicates the idea that the first trilobites were sutureless, and their descendents evolved sutures. Instead it could also be that the fallotaspidoids and olenelloids represent an early lineage that did not develop facial sutures (other than marginal ones), while at least one very earliest clade bore sutures. Geyer (1996) even suggested that holmiid olenelloids may have arisen out of a sutureless variant of the otherwise sutured redlichioid Gigantopygus, which would be a reversal of the prevailing thought that sutureless trilobites preceed sutured ones! Geyer also noted that aside from sutures, it can be very difficult to distinguish between the cranidia of Lemdadella and Fallotaspis. The Bigotinidae were until recently placed in the Redlichioidea, but are now placed in the Ellipsocephaloidea in order Ptychopariida. The ellipsocephaloids are viewed as the bridge group between the orders Redlichiida and Ptychopariida, and in a review of the bigotinids, Pillola (1993) suggested that "bigotinids may represent a morphology close to the common ancestor of the two superfamilies of the opisthoparian trilobites at the beginning of Cambrian times." Indeed, in any chart of trilobite evolution, if the bigotinids are considered Ptychopariida, then that order must share the honor of the earliest clades of trilobites. It is more likely true that the ordinal separation of the earliest trilobites is problematic, with otherwise very similar and obviously closely related trilobites separated on the basis of facial sutures and little else. Jell (2003) offered several considerations on the early evolution of trilobites, presenting evidence that the primitive condition for hypostome attachment was natant, not conterminant as proposed by Fortey (1990). In that case, that primitive natant condition is maintained in the Redlichiida and the Ptychopariida, while the conterminant condition becomes the primary state for derived orders such as Lichida, Corynexochida, Asaphida, and Phacopida. Jell also offered an origin of the Agnostida via the Bigotinidae, demonstrating similarities between both the glabellar and pygidial characters of meraspid bigotinids and holaspids of early eodiscines such as Tsunyidiscus, and proposing an origin of the eodiscines via progenesis, retaining bigotinid meraspid morphology while attaining reproductive maturity. He also offered early evolutionary pathways for the origins of the primitive Asaphida and Corynexochida. 1. Orders Redlichiida (Fallotaspidoidea) and Ptychopariida (Ellipsocephaloidea) share the honor of being the first orders of trilobites. 2. Marginal sutures do not cleanly predate opisthoparian sutures in the fossil record. 3. The natant hypostomal condition is likely the primitive state. Very shortly after trilobites appeared in the lower Cambrian, they rapidly diversified into the major Cambrian orders: Redlichiida, Ptychopariida, Agnostida and Corynexochida. These orders in turn proliferated, diversified, and gave rise to the rich variety of forms that trilobite workers have described in ten orders, well over 175 families, over 5,000 genera, and over 17,000 species, persisting for a quarter of a billion years before their extinction at the end of the Paleozoic Era. I acknowledge the kind and very helpful guidance for this page provided by James Cook, and Stewart Hollingsworth, who offered sources, corrections, clarifications, and feedback on this page, as well as thoughts on the discussions presented here. Any errors or shortcomings on this page, though, are mine. Feedback from other trilobite workers is always welcome! Fortey, R. A. 1990. Ontogeny, hypostome attachment, and trilobite classification. J. of Paleontology. 33:529-76. Geyer, G. 1996. The Moroccan fallotaspidid trilobites revisited. Beringeria, 18, 89-199. Jell, P. 2003. Phylogeny of Early Cambrian trilobites. In: Lane, P.D., Siveter, D.J. and Fortey, R.A. (eds. ), Trilobites and their relatives, contributions from the Third International Conference, Oxford, 2001. Special Papers in Palaeontology, 70. The Palaeontological Association, London, 45-57. Liñán, E., J.A. Gámez Vintaned, & R. Gozalo. 2015. The middle lower Cambrian (Ovetian) Lunagraulos n. gen. from Spain and the oldest trilobite records. Geological Magazine. FirstView Article pp 1 -14. doi: 10.1017/S0016756815000084 Published online: June 2015. Pillola, G.L. 1993. The Lower Cambrian trilobite Bigotina and allied genera. Palaeontology, 36, 855-881. Sdzuy, K. 1978. The Precambrian-Cambrian boundary beds in Morocco (preliminary report). Geological Magazine; March 1978; v. 115; no. 2; p. 83-94. When all is said and done, it is clear that trilobites began their evolution long before their first known appearance in the fossil record, presumably in the form of uncalcified arachnomorph arthropods, such as revealed in the rich assemblages known from Chengjiang and the Burgess Shale. Regional workers like to claim that their first trilobites are the oldest on the planet, but at any time in the future, a locality might be found that pushes trilobites even further back. For example, the oldest trilobite in Laurentia was long "known" to be Fallotaspis tazemmourtensis, based on a single specimen in California described in 1964. However, this incomplete specimen was shown to be a misidentified product of transport from younger strata. Then, below the Fallotaspis Zone, an older assemblage (the Fritzaspis Zone described above) was discovered and described. In 2015 another Spanish ellipsocephaloid, Lunagraulos tamamensis, from the lowermost Ovetian Stage, was added to the list of earliest trilobites. So the search for the oldest trilobite will continue to be a work in progress.